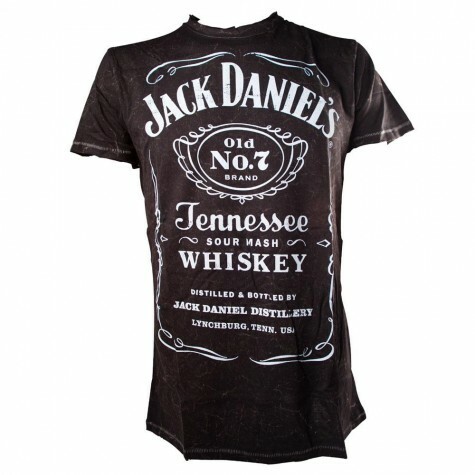 New Jack Daniels Classic Acid Washed T-Shirt Crew Neck Short Sleeve Casual Top. Jack Daniel'S Themed Old No.7 Brand Logo. The perfect present for fans of Jack Daniel?s. This t-shirt is made from 100% cotton and has a stunning design which has an acid distressed effect all-over. Includes the distinctive Jack Daniel?s Old No.7 Brand logo in white text on the front. It also has the text Tennessee Sour Mash Whiskey and Distilled & Bottled By Jack Daniel Distillery Lynchburg, Tenn. USA..
Short sleeves - Colour: black - Size: extra small - Classic design with acid effect all-over - Jack Daniel?s Old No.7 Brand logo in white text - Includes white text Tennessee Sour Mash - Includes white text Distilled & Bottled By Jack Daniel Distillery Lynchburg, Tenn. USA.